Sports-enthusiast or not, your teeth can be knocked out. For some people, a knocked out, or avulsed, tooth is a simple dental emergency. In truth, a knocked out tooth is a serious dental emergency that needs utmost care and immediate attention. At Ria Family Dental Care, we have same-day emergency appointments to relieve you of your pain as soon as possible. A calm reserve is very important in any dental emergency, particularly in the case of a knocked out tooth. Your tooth’s chance to be reimplanted depends largely on how you handle the first few minutes after it is knocked out. Aside from being calm and quick, there are also other important things to remember. A knocked out permanent tooth is different from a baby tooth. You can re-implant a permanent tooth by yourself, but implantation of young children’s teeth should be handled by a dentist, otherwise you can damage the developing tooth underneath. Most kids have their full set of permanent teeth when they reach 12-13 years old. So, if a child’s tooth is knocked out, be sure to know if it is a permanent or a baby tooth. Pick the tooth up by the crown and do not touch the root. Rinse it with clean water for no more than 10 seconds. Do not brush or scrape. Rinse only if the tooth is dirty. Attempt re-implantation. Reinsert the tooth into its socket and gently bite down on a soft towel. Go to your dentist within 30 minutes of the injury. Pick the tooth by the crown and do not touch the root. Rinse it with clean water for no more than 10 seconds. Do not brush or scrape. Do this only if the tooth is dirty. 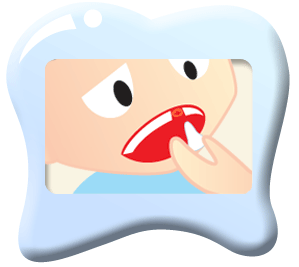 Soak the tooth in milk, saline solution or saliva on your way to the dentist. For a repositioned tooth, your dentist will perform a series of tests to ensure that it is properly placed. For unsuccessful re-implantation, Ria Family Dental has tooth replacement options such as dental implants, dental crowns, and dental bridges. If you or your loved ones have a dental emergency, you can count on your trusted Ria Family Dental dentist. We have same day dental emergency appointments to relieve you of your pain as soon as possible.